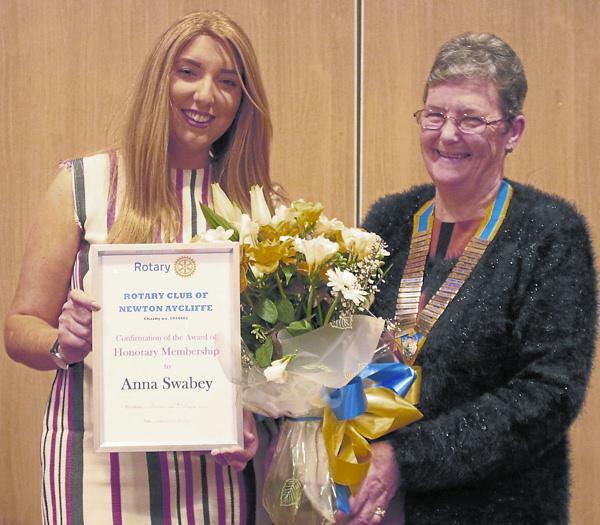 Newton Aycliffe cancer campaigner Anna Swabey has been honoured by Rotary International in Britain and Ireland with a prestigious ‘UK Young Citizen of the Year’ award. It not only recognises her outstanding work to raise both awareness and funds for greater research into brain tumours while fighting a personal battle against terminal brain cancer but also earns her a £500 donation for her chosen charity – the Brain Tumour Research Campaign. Close on the heels of her UK triumph came news of a second honour for Anna. She was made an honorary member of the Rotary Club of Newton Aycliffe and presented with her membership certificate by club president Denese Cartwright. She began to write a regular blog on Wordpress shared on Twitter and Facebook (she called it ‘Inside my Head’) and to organize a major awareness and fund-raising campaign to enable more brain tumour research. Her enthusiasm proved infectious and brought support from people throughout the UK. In just over a year, Anna’s backing for an online petition calling for a government debate on the need for more cash for brain tumour research has attracted 120,000 signatures and so will now be debated at Westminster. At the same time, her fund-raising projects have generated over £40,000. Though brain tumours are now the biggest cancer killer of people under 40, research into their cause and treatment attracts only one per cent of the national research budget. Anna says: “That’s got to change”. Later this year, Anna will have another cause for celebration. She and fiancé Andy Bell are to be married. Rotary president Denese commented: “Words cannot describe how delighted we all are”. The Picture above shows Anna receiving her certificate of Honorary Membership from Club President Denese Cartwright.